Last year, the entire state of Minnesota saw no snowfall after the month of February. This morning, on April 20, close to an inch of snow accumulated briefly in St. Peter. The upper atmosphere has been downright cold this week (for this time of year), which is why we’ve been seeing the white stuff again yesterday and today (La Niña conditions are persisting as predicted…see the December 10 installment of “Arb Sightings”). Better weather is on the horizon, however, as high temperatures are forecast to approach or exceed 60 degrees Fahrenheit all next week beginning Sunday; we might see more rainy days than sunny days, though, so keep that rain jacket and umbrella handy. Even if this morning didn’t look quite like late April, it sure sounded like it. Western Chorus-Frogs can currently be heard “clicking” from the Arb’s ponds at all times of the day and night, and Northern Cardinals and Chipping Sparrows are singing their spring songs in full force near the Interpretive Center. A couple male Red-winged Blackbirds have staked out potential territories in the Jim Gilbert Teaching Pond; their harsh “konk-a-ree!” songs are given intermittently throughout the day as nearby American Robins add their own repertoires to the spring concert. 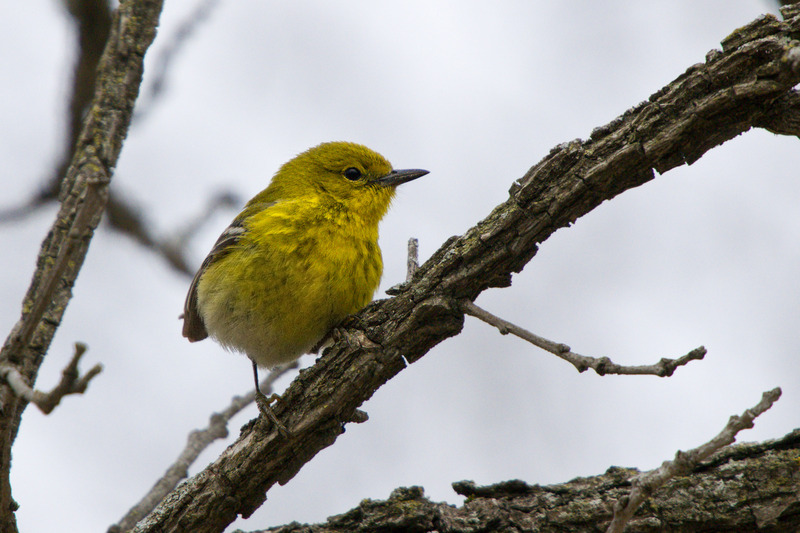 Pine Warbler foraging in decidous forest north of Borgeson Cabin, 4/17/11.